In Finland people with chronic conditions, in particular dementia and alcoholism, tend not to vote (see figure below). It is easy to understand why. What about pwMS? The good news is they tend to get out which means they are actively participating in politics; well at least in Finland they are. This is important. Finland is a liberal/social democracy and having a democratic say is important for people with chronic disease. This means pwMS are expressing themselves politically and must indicate they are functioning well both socially and politically. This is very good news. I would be very interested in seeing data on voting amongst pwMS internationally, particularly in the UK. At has always been my impression that MSers are quite passive; may be because of MS being so stigmatizing and a lot of pwMS are still in the closet. Based on this Finnish data I am clearly wrong. Voter turnout in the 1999 Finnish parliamentary elections by chronic conditions (N=431 676) based on a binary logistic model with 95% CI adjusted for gender, age, education, occupational class and household income, partnership status, cohabitation with underaged children and hospitalisation during Election Day. The vertical line indicates the overall level of turnout in the study population (68.3%). Sund et al. 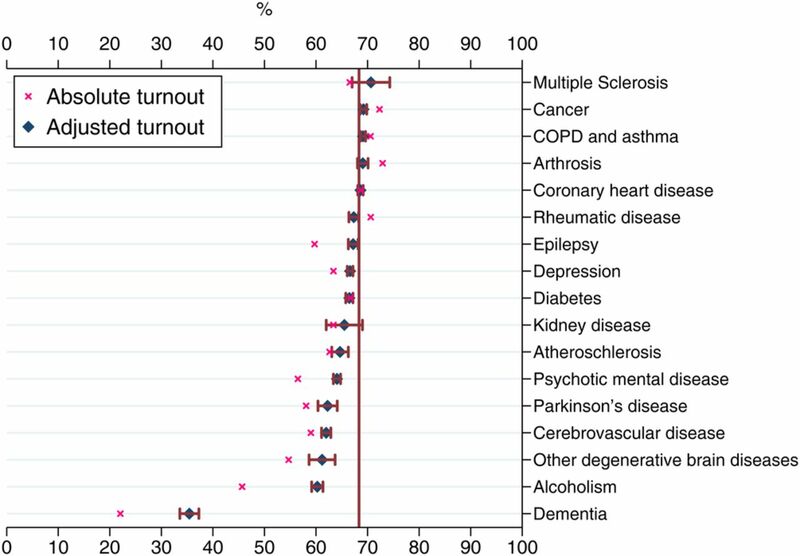 How voter turnout varies between different chronic conditions? A population-based register study. J Epidemiol Community Health. 2016 Dec 13. pii: jech-2016-208314. BACKGROUND: While poor self-rated health is known to decrease an individual’s propensity to vote, disaggregation of the components of health on turnout has thus far received only little attention. This study deepens on the understanding of such relationships by examining the association between chronic diseases and voting. METHODS: The study uses an individual-level register-based data set that contains an 11% random sample of the entire electorate in the 1999 Finnish parliamentary elections. With information on hospital discharge diagnoses and reimbursements for drugs prescribed, we identify persons with chronic hospital-treated diseases (coronary heart disease, chronic obstructive pulmonary disease (COPD) and asthma, depression, cancer, psychotic mental disease, diabetes, cerebrovascular disease, rheumatic disease, epilepsy, arthrosis, alcoholism, dementia, atherosclerosis, Parkinson’s disease, other degenerative brain diseases, multiple sclerosis and kidney disease). RESULTS: After adjusting for gender, age, education, occupational class, income, partnership status, cohabitation with underaged children and hospitalisation during Election Day, neurodegenerative brain diseases had the strongest negative relationship with voting (dementia OR=0.20, 95% CI 0.18 to 0.22; others up to OR=0.70). Alcoholism (OR=0.66) and mental disorders also had a negative association (depression OR=0.91; psychotic mental disease OR=0.79), whereas cancer and COPD/asthma had a positive association (both OR=1.05). Having more than one condition at a time further decreased voting probability. CONCLUSIONS: By showing how different health conditions are related to voter turnout, this study provides essential information for identifying gaps in the potential for political participation and for further inquiries aiming to develop models that explain the link between health and voting probability. I'm pleased to say that I voted in the referendum and voted to Leave. Uncontrolled immigration has put too much pressure on our services such as health + you can't plan for a service if you have no idea of the demand. You bought the lie then. Remember that the NHS would be unable to function without immigrant health professionals both from the EU and elsewhere. Sigh. Maybe this is why people with MS are supposedly "passive". Maybe they are just tired from being judged every time they make a choice a healthy person didn't. Yes if anyone read a particular MS forum then yes many voted. However, the voting seemed to be split both ways just like the end result. Please let's not turn this into a Brexit debate. It is about pwMS being well-enough and engaged-enough politically to vote. I'm well enough to vote and I haven't. What does that say about me? Life is not a piece of medical research. Making generalisations, particularly what can be perceived as negative generalisation, is hurtful and pointless. In this case, it won't help you prescribe different DMTs to individuals with MS. So what's the point of this? I'm so preplexed at the point of this. The article itself does not call anyone passive for not voting – it just says, that after accounting for 8 other factors that influence voting turnout, neurodegenaritive conditions is another reason people don't participate (duh). It does not say that voting is an indication that certain subgroups “must be functioning well both socially and politically” and frankly I’m at a loss how you got there. Everyone who can vote should vote because it’s a sign they are functioning well socially and politically? Huh???? It’s a slippery slope. Is there really a need to generalise about people with MS on the basis of Finish 1999 voter turnout and to use words like “passive” to describe them? The French revolution is over, finished some time ago. Let's not classify people with MS into "passive" and "active" citizens. It's not nice. It carries negative connotations. Is there really a need for it? (Some) of you are doctors. We rely on you to interpret medical jargon and take care of our health. You don't need to get all excited because some study of Finnish voter participation found that people with MS turned up at the 1999 Finnish election at the same rate as their general population. Anyway, looking at the graph, my conclusion from that study would be the 68% participation (compared to 70% general population) amongst different conditions was in fact bloody good. That dementia, alcoholism and mental illness significantly lead the bottom of the pack is not surprising. Why did you take this general article and turn it into a commentary on social participation and well-being of people with MS? I assume you are new to the blog; we have debated this issue in the past. When I tried to set-up a MSer protest in the past, similar to what happened with HIV and HAART, around the upcoming EMA-alemtuzumab decision the community didn't have the energy for it. Always nice when you are proved wrong. Prior to this study I would have assumed that pwMS would have a lower voter turn-out than the general population. Nothing like data to change an assumption or a hypothesis. I'm not new to the blog. Your experience at lack of activism on EMA-alemtuzumab issue could have other explanations, I think it's unfair to proclaim a population passive for lack of activism on one of many issues which are important. It's not about data changing an assumption or hypothesis… it's about whether the data (your experience)supported the assumption of impassiveness on a population level in the first place. Next question is whether the Finish voter participation numbers in 1999 do in fact in any way settle this impassiveness debate… but that's besides the point. Again, the CCSVI and HSCT movements – whatever you may think of them – don't paint a picture of a passive population. (Dissatisfied perhaps, but not really passive). "Always nice when you are proved wrong. Prior to this study I would have assumed that pwMS would have a lower voter turn-out than the general population." Ps. Now you know that in 1999 in Finland, people with MS (and other conditions) had almost the same voter turnout as the general population. Would this same proposition hold true in the US, where access to health services is not the same as in Finland and where the general population voter turnout is 50%? CCSVI and HSCT phenomena are driven by a handful of very vocal people with MS. They have largely been supported by charlatans determined to make money out of a very vulnerable group of people. The real influence here is the marketing campaigns of those determined to make a quick buck. Fortunately, with pharmaceuticals there is a strict code of practice that largely prevents this from happening. So The CCSVI and HSCT movements are driven by a handful of vocal people with MS who impose their will on the balance of the passive population? These few handful of vocal people with MS who championed the CCSVI movement were so powerful and so very different from the general MS population that they single handedly persuaded the world to devote money and time into research to test what they thought was happening, while the rest of the passive MS population was just following? And then it happened again with HSCT? (Except CCSVI and HSCT are nothing alike). The CCSVI and HSCT movements are the result of efficient marketing by money hungry charlatans, as opposed to the Big Pharma who are so well regulated they don't use marketing on vulnerable people to make money? At this rate, people with MS will never do much of anything cos it seems they are at the mercy of all sorts of handful vocal people and they just follow like lemmings. Hey, maybe all people with MS voted for Trump cos he screamed the loudest? And maybe none of us should worry about that secret Trans Pacific Trade partnership and because the governments’ codes of conduct worldwide will protect us and ensure that Big Pharma acts responsibly even when there is a conflict between acting responsibly and making money? Ps. I'm not arguing the merits of CCSVI or HSCT. I'm arguing against the proposition that people with MS are passive. Honestly, I am not even clear on what this 'passivity' means – perhaps I'm misinterpreting it with the word passion. "At has always been my impression that MSers are quite passive; may be because of MS being so stigmatizing and a lot of pwMS are still in the closet." I have had PPMS for well over 15 years and am in no way passive! I am always _passionate_ about voting, for example! And I personally never believed I had a "stigmatising" disease – it is not the result of a lifestyle choice, I did nothing to cause it, and I am fighting on to live well with it. And I am still loving life and my loved ones I might add. So sorry – stuff and nonsense from where I'm standing, although some others will no doubt agree with you. But I wish you a nice Christmas. Since I turned eighteen, (a couple of days too late to stop Thatcher getting in), I have voted in every election and referendum, local and national, in which I have been eligible. As it happens, I have always voted for the party that founded the NHS as, even when I have disagreed strongly with some of their policies, the other side were always worse. And now, living with MS, I witness this government's erosion of the Health Service at first hand and feel even more strongly about the issue. I used to enjoy the ritual of going to the polling station and marking my cross but nowadays I am registered for a postal vote so I get my ballot paper automatically and it takes just a couple of minutes to mark it and stick it in the envelope. It's quick, easy and free and, even if you don't vote the way I want, I wish more people would do it. I have become more interested in politics especially since becoming housebound. I have also changed my polical allegiance due in part to the continuous & insidious destruction of our health service. Sorry, but the whole ccsvi and hsct movements hardly paint a picture of a passive population. This generalisation really saddens me and I wonder how much of it is inspired subconscioulsy by cognitive disabilities and people exhausted from feeling they are being beaten by the system meant to protect them. I think trying to ascribe a behaviour to a group of people based on their diagnosis is rather pointless. According to psychologists, stereotyping leads to prejudice. Prejudice is an unjustified or incorrect attitude (usually negative) towards an individual based solely on the individual’s membership of a social group. Anyway, this blog entry is full of unjustified assumptions. "This is important. Finland is a liberal/social democracy and having a democratic say is important for people with chronic disease. This means pwMS are expressing themselves politically and must indicate they are functioning well both socially and politically. This is very good news…"
PS. I don't have MS and have not voted (protest vote) in the last 8 years. Does that mean I'm not functioning well, both socially and politically? I have MS, didn't vote in the 2008 or 12 elections due to the craptastic choices. In 2016, I not only voted for Trump, but I campaigned for him in my community and I donated to his election efforts. Save it if you're going to tell me I'm stupid. The people who don't question the lies we've been fed have their heads in the sand. It's time to protect our borders and make America great again. I work part time, because that's all I can do with my ms, and you better believe it pisses me off to have to pay taxes that go to help people who are freeloading off the system. Imdo get that many people need govt assistance. But there's absolutely another huge group who are lazy and want entitlements. That needs to end, and I believe our president elect will do it. lol i couldn't disagree with you more about trump doing much of anything, though i don't think the world is facing a catastrophe (we survived things worse than trump). i don't think you are stupid. i think people's voting practices are always dictated by the candidates available. Don't buy what Trump is selling. He is a misogynistic, xenophobic racist. We will see if the corporate billionaires can run the country better than the millionaire politicians. Can you please comment on this study? It is making my head hurt. Most people with MS don't want to make a noise about having the disease. We hide it from our partners, family, friends, employers and the world. Why would we want to become activists when we don't want anyone to know that we have this goddamn dreaded, awful, stigmatising disease? Being passive is our default position.